Welcome to the 24th edition of the Carnival of Divided Government- The special "Lost at Sea" Edition. As explained in earlier editions, we have adopted Latin ordinal numeration in order to impart a patina of gravitas reflecting the historical importance of the series. In this, the Carnival of Divided Government Quattuor et Vîcênsimus (XXIV), as in all of the CODGOV series, we select volunteers and draftees from the blogosphere and main stream media writing on the single topic of government divided between the major parties (leaving it to the reader to sort out volunteers from draftees). Consistent with this topic, the primary criteria for acceptance in the carnival is to explicitly use the words and/or concept of "divided government" in submitted posts. A criteria that, to our endless befuddlement, is ignored by many of the bloggers submitting posts, which sadly results in DWSUWF reluctantly ignoring their fine submissions. The Admiralty of the DWSUWF blog has temporarily transferred command to the bridge of the Morpheus (pictured above leaving San Francisco Bay). Morpheus is a Schumacher 50 racing/cruising sailboat about to embark from Hawaii to San Francisco. 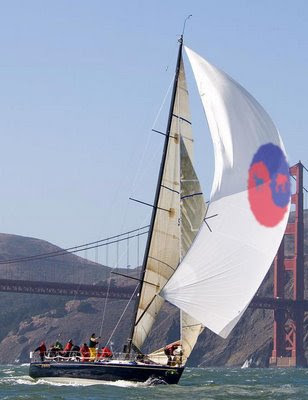 She just finished the Pacific Cup race from San Francisco to Hawaii and will be making her way back. MW is serving on the delivery crew as ballast for the return trip - as the saying goes - "From each according to their abilities..."
This CODGOV carnival was prepared prior to embarking on the journey back, while we still have access to some big internet tubes. This is our last night on-shore, and I will be publishing shortly before settling into our new home on Morpheus. I may or may not be able to see any comments until we reach SF around the 17th, and my brother HDW may or may not moderate comments that are posted here when I am gone. However, if anyone really wants to berate me over this or other posts real-time, there is a way to e-mail me short text-only messages on the boat, and I have left sufficient clues for a dedicated commenter to figure it out. The theme for this particular carnival cruise, is the impact that the "Divided Government" meme may or may not have on the 2008 presidential election. We expect increasing visibility and debate on the topic in the months before election day, much as we saw in 2006. With that visibility, comes argument and invective targeting the meme, hurled by those threatened by the logical conclusion demanded by a divided government voting heuristic - To whit: The only way to maintain a divided government state, is to elect John McCain President for one term. So let us unfurl the main, set sail, and weigh anchor me hearties. "It drives the talk radio crowd nuts when McCain does not wage war on Pelosi and Gore," said Hoover Institution media fellow Bill Whalen. McCain, he said, likely was trying to reach out to moderate and independent voters during his San Francisco visit... At some point, the McCain campaign has to make Congress and the Democratic majority an issue in this campaign ... it's something McCain has to wrestle with," Whalen said. There are three key issues at stake, he said: "The bad performance of the Congress - the reason why the approval rating is 9 to 14 percent. The second is what they want to do when Obama comes into office." The third is the issue of divided government - whether Democrats should indeed control both houses of Congress and the White House, he said." Exactly so, and the very advice that mw has been offering to the McCain campaign for some time. "Obama should also have been prepared for McCain to launch an appeal for divided government, by touting his alleged ability to work with Democrats in Congress to get things done. McCain has already started this with an editorial board appearance with the San Francisco Chronicle this week, wherein he said nice things about Nancy Pelosi and praised Al Gore's work on climate change. You'll hear more of this (but not in front of the cultists naturally) from McCain in the coming weeks, because if he can establish his bipartisan street cred narrative while his Tier Two effort savages Obama's character and image, he wins over the independents and gets the White House." Given that Obama has a 95% toe-the-party-line voting record in the Senate, while McCain bucks his party 20-30% of the time, establishing his bipartisan street cred should not be too difficult. Sometimes on a boat, you find yourself next to a fellow traveler that you would just as soon not have on the boat. Such is the case with a recent Bill Kristol column. I am reluctant to cite Bill Kristol as a validation for the DWSUWF perspective on divided government, as Bill Kristol has been so publicly wrong for so long about so many things and in particular anything to do with Iraq. Instead I offer Kristol's comments as an early example of another point I have been making for a while. As we get closer to the election, partisans on the right will disingenuously begin to promote the divided government meme as they recognize that there is very little else to move independents, moderates and libertarians to vote for McCain. This is a good thing and I welcome it, as this is truly a case where any publicity is good publicity regardless of source. 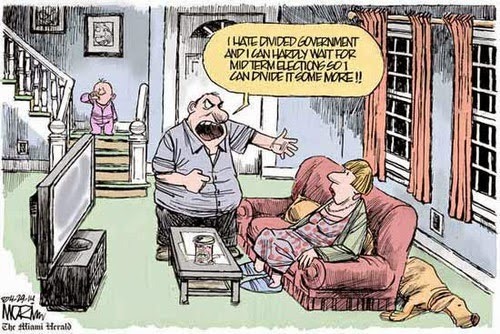 The case for divided government is a common sense argument that stands on it own merits, and will resonate with voters regardless of who is promoting it or their motivation. Even Bill Kristol. "...I read a report of a fund-raising letter from Obama on behalf of the Democratic Senatorial Campaign Committee, arguing that “We must have a deadlock-proof Democratic majority.” Yikes. But then it occurred to me that one man’s “deadlock-proof” Democratic majority is another’s unchecked Democratic majority. Given the unpopularity of the current Democratic Congress, given Americans’ tendency to prefer divided government, given the voters’ repudiations of the Republicans in 2006 and of the Democrats in 1994 — isn’t the prospect of across-the-board, one-party Democratic governance more likely to move votes to McCain than to Obama? So I cheered up once again. For it will become increasingly obvious, as we approach November, that the Democrats will continue to control Congress for the next couple of years. But if the voters elect Obama as president, they’ll be putting Barack Obama, Nancy Pelosi and Harry Reid in untrammeled control of our future." It is certainly legitimate to question Kristol's sincerity, as he was much less vocal about the virtues of divided government when our country was equally in need of divided government in 2004 and 2006. No surprise there. Also not surprisingly, the partisans on the left who were invoking divided government as a voting rationale in 2006 are notably silent now. As interesting as Kristol's comments themselves, are the reaction they generated on the left. JCasey at Non Sequitur points out Kristol's logical fallacies, but then ignores scholarship and most of the documented modern historical record of voter preference for divided government in his post "Argumentum ad dictum". "Kristol is guilty of two big mistakes. The first is a priorism–while the evidence he mentions relates to the conclusion (even though the claim about the dissatisfaction with the "democratic" congress is misleading), the availability of empirical data makes such recourse to a priori notions unnecessary. One can, in other words, track poll data now–poll data which paints a rather different picture (so he at least ought to argue against that). Second, the repudiation of majorities 12 years a part does not demonstrate much (it's only two instances) about American distrust of one-party rule–besides, in neither of those years were their Presidential elections." The Truffle thinks that Kristol is a buffoon. Little Garlic posting at The Garlic exemplifies the hubris on the left, and is making plans for an Obama inauguration, saying "Considering Stumblin Bumblin' John McCain's considerable campaign skills, a convey of bulldozers and payloaders won't "move votes to McCain than to Obama". Brian at Incertus thinks Kristol is "giving American voters way too much credit". Maybe. And maybe American voters have more common sense than any of these bloggers or the left give them credit for. While the electorate may be perfectly willing, even eager, to punish a Republican Party so deserving of punishment, they may still be reluctant to give one party the most concentrated power we have seen in generations. It is just common sense. Most of the worst excesses of the last eight years would not have occurred if voters had denied Republicans single party control. "If Team McCain can’t come up with a positive strategy to convince Americans he is the right man for the job - rather than simply sounding the alarm that Obama is the wrong man - perhaps it is time to get away from the whole attack mode and try this new strategy. Our government dove too far to the right under iron-clad GOP control. Will we be better off if we turn around and let them swing equally off to the left?" Let me think about it, Jazz. the answer is: HELL NO. While we are on the topic of the kind of corruption to be expected in single party government, I could not be happier about the indictment of Ted Stevens. He is a picture perfect example of the corrosive effect of earmarks in the legislature, and shows just how bad it can get when you have the kind of cozy camaraderie and lack of oversight that always occurs in a single party government. In this election year, the Stevens indictment has ramifications, offers a lesson, and serves as a warning for the possible single party Democratic government to come. By gutting the earmark reform bill last year, the Democrats have shown no interest in cutting this cancer out of the legislative process and as such - should they prevail with a single party victory in both legislature and the executive branch - this kind of story will continue unabated for the next 2-4 years at least. The only difference is that there will now more Democrats than Republicans lining up to take their turn on the perp walk. "So it's looking right now as though there will still be divided government of sorts, regardless of who wins the White House, since Republican senators will still be able to slow down or kill legislation it opposes. " 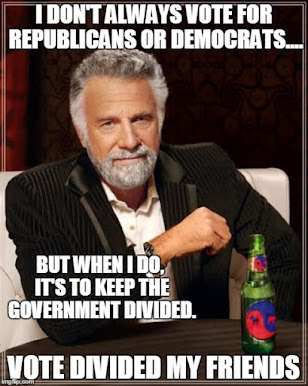 Not to put too fine a point on this, but "divided government" is a specific term that has a specific definition and precise meaning as used by historians, economists, and political scientists who research the consequences of divided vs. single party control of the federal government. The definition of "divided government" is not the ability of an opposition party to "slow down or kill legislation". It is not even a "divided government of sorts". The definition of "divided government" is that a single party does not hold the executive branch and control a majority in both legislative branches of government. Full stop. As such, the only way we could realistically continue to have a divided government state in 2009, is if John McCain wins the presidency. The reason why it is important to be precise about the use of this definition, is that the scholarship outlining the benefits of divided government (restrained growth of spending, greater oversight, less corruption, fewer wars, longer lasting and better considered major legislative reforms - see Mahew, Nisknanen, Slivinski, et.al.) is rendered useless if the same definition is not used. "If hope that if he is found guilty that he punished to the fullest extent of the law. Additionally I hope that he is the last of the corrupt Republicans still in office. I have little doubt that had the GOP not been in the majority he either would have kept his nose clean or been indicted sooner. That brings me to one of my chief concerns about an Obama presidency. I fear that should the Dems control the house, the senate, and the Oval Office that we'll see the same level of corruption and excess. To me this is one of the most important functions that divided government serves. By that I mean as long as one party feels that the other is is breathing down their neck waiting for them to screw up they tend to stick to the straight and narrow." "At a minimum, the risk of continuism is greater with McCain than Obama, and that may be enough for those who share Hunter’s concerns to take the plunge and support Obama (as, for example, Andrew Sullivan did some time back). Indeed, I count myself basically in that camp. The main positive reason I can conjure for voting for McCain is divided government. However, since the current divided government situation has not generated much in terms of addressing these keys issues about executive power, one wonders about that argument as well. At a minimum I find myself for the first time in my life in a position where I could see myself voting Democratic, Republican or Libertarian. And, I suspect that I am not alone. I was having a conversation the other day with a lifelong friend who is also a lifelong conservative. He concurred that he, too, had a similar view on the choices and his own possible voting behavior." Andrew Sullivan was only too eager to latch on to Taylor's rationale. Sullivan's preference for Obama is well established. But Sullivan has yet to resolve the dilemma of how to support Obama without contradicting his strong and passionate support of Divided Government in 2006. Methinks both Taylor and Sullivan doth protest too much. While I have wrestled with these issues myself, I cannot help but wonder whether Steven, Larry and Andrew are straining logic and back filling self serving rationalizations for an appealing candidate they simply like and want to support on an emotional level. The real risk of the "continuism" that Doctor Taylor fears, is the risk of continuing the abuses of single party control of the Federal government, but this time with a 95% toe-the-party-line President, supported by a 100 vote majority in the house and a potential 60-40 filibuster proof Senate super-majority. As Dr. Taylor himself points out, the FISA vote shows that Obama has no particular desire to impose any legislative constraints on his own executive power. In addition, he will have bigger majorities in the legislature than the Republicans ever enjoyed under Bush43. Why would anyone think that the Democrats will suddenly behave as angels with that much power? His unsupported argument that divided government did not sufficiently curb the executive power grab is spurious. The fact is that the divided government state did begin to reverse that trend. Six years of abusive single party control are not going to be undone by 18 months of divided government. Yet, as a direct consequence of divided government, we have a new Secretary of Defense, a new Attorney General, a marginal improvement in the Patriot Act and FISA vs. the Bush/Cheney versions, a great deal more oversight revealing many of the abuses of the six years of single party control, and a reduction in the rate of spending growth in 2007. These improvements, though marginal, should not be dismissed out of hand. It is absurd to believe that handing all the levers of power to the Democrats is the answer to the abuses we saw as a result of handing all the levers of power to the Republican. And with that we conclude this edition. Thanks for stopping by, and thanks for all of the submissions (on-topic or not). The next edition will be the Carnival of Divided Government Quînque et Vîcênsimus (XXV) - Special "Labor Day" Edition, which we will be working diligently to produce on or about the 1st of September. Submit your blog article at carnival of divided government using our carnival submission form. Thanks for reading my post. But if you read it carefully, you'll notice that my point is not to affirm the opposite of whatever Kristol is saying, but rather merely to point out that his argument fails (for the reasons mentioned). So I don't have poll data that supports an argument, as you allege. I merely point out that Kristol might have examined poll data to make his point. Thanks for the link and the discussion of my post. I would say this, however: I am not seeking to justify a vote for Obama in my post, and haven't been a declared supporter the way Sullivan has (although I am sympathetic, to a point, to his position). The thing is that divided government actually hasn't solved the more egregious problems I that see within the federal government (as we have had it since January 2007) so I am pondering whether, in fact, an Obama administration way might not fix some (not all, by any means) of those issues. I have not reached a conclusion as yet. Specifically, the "continuism" that concerns me includes the appointment of persons to positions within the defense, legal and security apparatuses of the US who are ideologically similar to the current administration than would be the case for an Obama administration. The issue about a lot of GWOT policies that concern me are currently located in the execution of the policies as much as they are in the legislative side (at the moment). Further, legislative solutions are more likely, I think, under an Obama administration than under a McCain one.